Soaring temperatures kicked off the week of the Fourth of July throughout the Northeast. The high humidity, along with temperatures in the 90s, made it feel as though it were over 100˚F in some areas. The heat index for New York City (which measures how hot it feels when relative humidity is factored in with the actual temperature) was 106˚F on July 1 and was 110˚F in Baltimore, MD on July 3. Excessive Heat Warnings were issued throughout much of the Northeast by the National Weather Service during that week. Daily high temperature records were set at numerous locations throughout New York, Vermont, and Maine, with Burlington, VT experiencing its warmest three-day stretch on record from June 30 through July 2. Record warm minimum temperatures were set at multiple climate sites in the region from July 1 through July 5. Mount Washington, located at a height of 6,288 feet in New Hampshire and known for its extreme weather, tied its all-time warmest minimum temperature of 60˚F on July 2 (based on records going back to 1932) and ended up reaching 71˚F at the summit later that day. 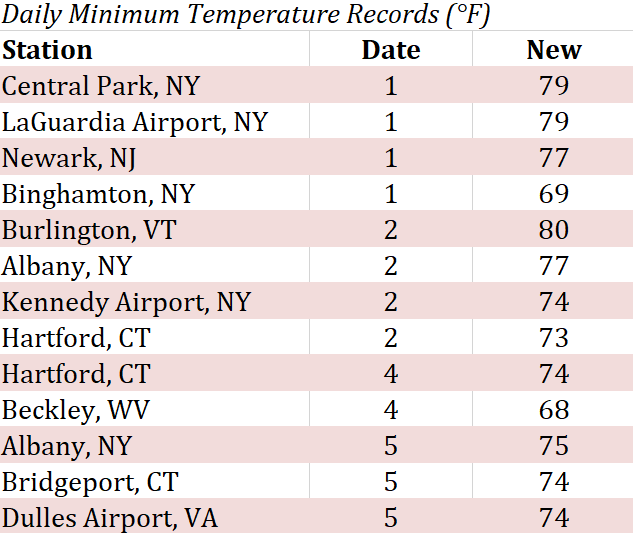 Record warm minimum temperatures were also set at many cities within the region during the first five days of the month. 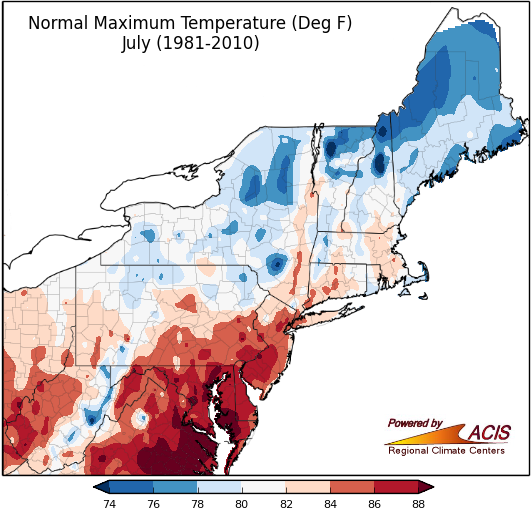 Normal maximum temperatures for the Northeast during July. July is typically the hottest month of the year for all but one of the 35 major climate sites in the Northeast, with August being the warmest month on average for Beckley, WV. The mean maximum temperatures for the region during July range from 76.0°F in Caribou, ME, to 88.4°F at Washington National, DC. The Northeast’s all-time highest temperature, according to the National Centers for Environmental Information (NCEI), is 112°F on July 10, 1936 in Martinsburg, WV (and August 4, 1930 in Moorefield, WV). The highest July temperatures ever recorded at each of the major climate sites in the Northeast.